Barrick Gold Corp. initially made an offer to buy Newmont Mining Corp. in February, but was turned down. Instead, Newmont proposed the two establish a Nevada joint venture. On March 11, the two companies signed an implementation agreement to create the joint venture, which would combine their mining operations, assets, reserves and talent in Nevada. 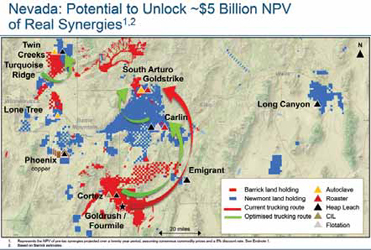 Newmont’s assets in Nevada include Carlin, Phoenix, Twin Creeks, and Long Canyon and Lone Tree properties while Barrick’s Nevada assets include Cortez, Goldstrike, Turquoise Ridge, Goldrush and South Arturo. Development assets include Fourmile, Mike and Fiberline. Following the completion of the joint venture, the Nevada complex will be the world’s single-largest gold producer, with a pro forma output of more than 4 million ounces (oz) in 2018, three tier one assets, potentially another one in the making, and 48 million oz of reserves, the companies said. The agreement is expected to be completed in the next few months. The joint venture will exclude Barrick’s Fourmile project and Newmont’s Fiberline and Mike deposits, pending the determination of their commercial feasibility. As a result of this agreement, Barrick has withdrawn its Newmont acquisition proposal announced on February 25. Barrick Gold Corp. said its proposal to merge with Newmont would form a gold company with unprecedented potential for value creation. Barrick President and CEO Mark Bristow said the proposed merger would unlock more than $7 billion net present value of real synergies, a major portion of which is generated by combining the two companies’ assets in Nevada, including Barrick’s mineral endowments and Newmont’s processing plants and infrastructure. Barrick also recently merged with gold miner Randgold Resources and Newmont has entered into an agreement to purchase Goldcorp Inc. That transaction is moving forward as Goldcorp recently obtained an interim order from the Ontario Superior Court of Justice to hold its shareholder meeting in April. In the proposal, each Newmont shareholder would have received 2.5694 Barrick shares per Newmont share. Barrick shareholders would have owned approximately 55.9% of the merged company and Newmont shareholders would own approximately 44.1%. On March 4, the Newmont board unanimously determined Barrick’s proposal wasn’t in the best interest of Newmont’s shareholders.